Our second session in LAPIS focused on media history and theories. We looked at the history of printing, including Gutenberg’s printing press and the dawn of mass produced literature in Europe in the 15th century. We also looked at the history of paper and printing in China by reading an article by T. H. Barrett (2011). As the article points out, Chinese historiography has focused more on paper than printing in its analysis of information technologies. This is in contrast to European historiography which is more concerned with printing. The article helped to put Gutenberg’s invention into a wider context by exploring the origins of printing in China and showing that many of the technologies that have shaped European history – printing, paper, gunpowder. magnets – had their origins in the ancient world and spread to Europe via China and the Islamic world. The British Library has two copies of bibles printed by Gutenberg. 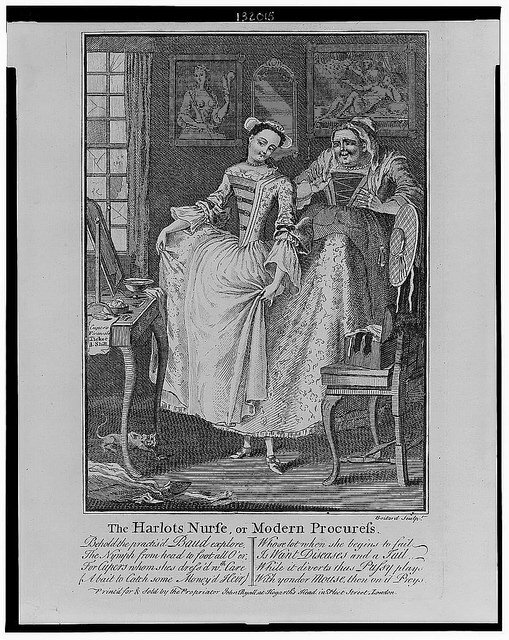 The digitised versions can be found here: http://molcat1.bl.uk/treasures/gutenberg/search.asp. The theories we discussed included Marshall McLuhan’s ‘the medium is the message’. This reminded me of our previous discussions of the relationship between form and content. It also made me think of an observation that Ernesto made in another module that the word ‘information’ contains the word ‘form’ within it. This reinforces the idea that the form that information takes is central to its meaning. We also looked at the idea of disruptive information technologies – technologies that change how we consume information. Are we sharing more now that it’s so easy to do so via Twitter and other social media? Are we less willing to pay for information with the flourishing of user generated content on the internet? Have our attention spans lessened because of the ‘potted’ information fed to us via apps, Twitter etc? I’d like to conclude by mentioning two ‘mavericks’ who have inspired me with their inventive approaches to media. Firstly, Xue Tao – the ‘woman who invented notepaper’ (Barrett, 2011). This Chinese courtesan (c. 768 – 831) wrote poetry, including verses for exchangers with her admirers which could be as short as 28 characters. However, the paper available at that time in Sichuan where she lived was too large for her poems. So she asked the manufacturers to make smaller sheets, introducing a new medium that had both ‘aesthetic and economic benefits when used as the medium for her poems’ (Barrett, 2011). M. McLuhan, 1911-1980 (1994). Understanding media: the extensions of man. Routledge, London. Libraries and publishing – where are they now? This is the first in a series of posts inspired by a module I’m taking for my MA. The module is called ‘Libraries and Publishing in an Information Society’ and you can follow it on Twitter using #INM380. Last week we looked at some definitions of publishing and the information society. In a time of rapid technological change, both publishing and libraries are having to adapt quickly. But are their fundamental roles changing? Our course leader, Ernesto Priego, suggested various resources for background information (all referenced on Mendeley). We looked at a video from the 2013 conference of the Association of Learned and Professional Society Publishers entitled ‘What is the publisher now?’. We also read Walter Benjamin’s 1934 essay ‘The Author as Producer’ translated from the German by John Heckman. The video was mainly about scholarly publishing but made some widely applicable points. A couple of points stood out for me. Firstly, the idea that peer networks and authors are becoming more important than publishers. Secondly, the trend for reading abstracts and reviews instead of the full content of articles, or viewing videos or slides on Slideshare instead of attending a lecture/conference. Thirdly the idea that traditional publishing channels (i.e. academic books/journals) are not meeting the needs of scientific researchers who can add value by publishing a dataset/algorithm/software but can only earn credit for this by publishing a paper about it. Finally, the importance of technological innovation was stressed but as a means to an end rather than an end in itself. The essay by Benjamin seemed to be arguing for authors to pay more attention to the form their work takes. This raised an interesting discussion about the relationship between form and content. Commercial publishing shapes a literary work in many ways – as an intern in various publishing companies I have seen first-hand the influence that sales and marketing teams can have on editorial decisions, from commissioning works to choosing titles and covers. There is also the interesting idea which Ernesto suggested that technologies are not politically neutral. For example, publishing online (unless it’s behind a paywall) means you are embracing open access. I’m not sure about Benjamin’s apparent support for Eisler’s idea that orchestral music needs reforming – specifically that words should be added to it. I don’t see the point of this. 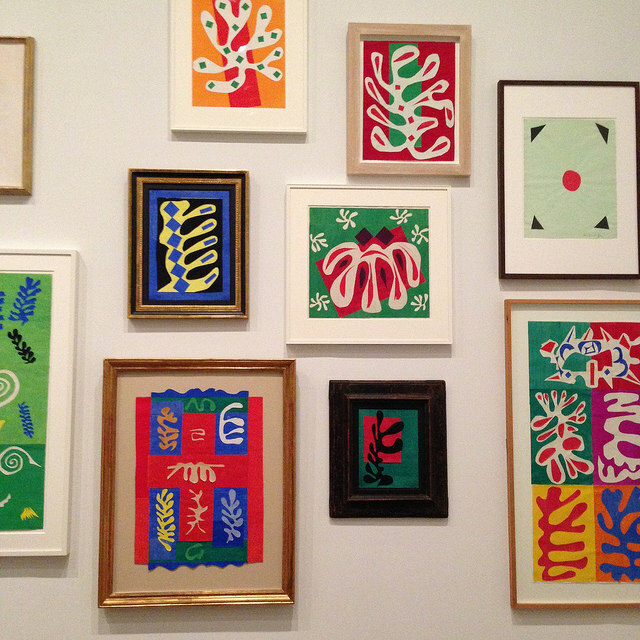 Why should art take on certain forms? Why ‘transform the concert into a political meeting’? The idea that listening to music on gramophones is rendering the concert business obsolete is interesting but I’m not sure that I agree. Listening to music live and listening to it on a recording are two different experiences and people enjoy both. The concert business is still flourishing. Also the reason that people still listen to orchestral music is the same reason that people still read classic books – it has a timeless quality and still feels relevant. 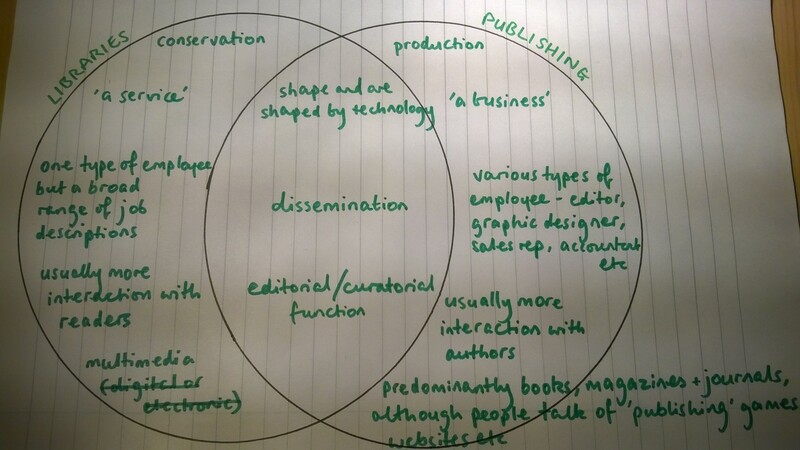 To conlude, I’d like to share a venn diagram I made exploring the roles of libraries and publishers and how they intersect. This was an exercise suggested to us in the lecture.